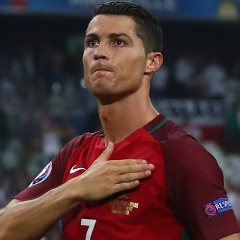 Cristiano Ronaldo's hopes of winning the World Cup with Portugal are running out. Portugal has proven it also has the mettle needed to win major international tournaments after it ground though the 2016 European Championship and stunned host France in the final despite an early injury to Ronaldo. Portugal will take the large part of that experienced squad to Russia. Pepe is a physical enforcer in defense, Joao Moutinho adds passing skills to its midfield, and newcomer Andre Silva can help Ronaldo in attack. Key player: Ronaldo (Real Madrid) - At 32, Ronaldo is no longer the goal machine he once was. Key to success in Russia could be how he is managed by Madrid, and can be rested in less significant games. Coach: Fernando Santos - Since taking over the team in 2014, Santos has forged a solid defensive block that gives just enough help to Ronaldo. With a surplus of talented midfielders and forwards, David de Gea in goal, and Sergio Ramos and Gerard Pique anchoring its defense, the one possible doubt may be who spears the Spaniards' attack. Alvaro Morata is in line to be Spain's striker after impressing at Chelsea. His only potential challenger is the man he replaced in London, Diego Costa, who will finally be back to playing after several months of inactivity when Atletico Madrid's transfer ban finishes at the start of January. Key player: Andres Iniesta (Barcelona) - Scored the sole goal of the 2010 World Cup final but will be 34 at next year's tournament. Coach: Julen Lopetegui - The 51-year-old former goalkeeper steered Spain through an undefeated qualifying campaign of nine wins and just one draw, including a 3-0 victory over Italy. It's taken 20 years for Morocco to get back to the World Cup. The North African team features several promising young talents including Ajax midfielder Hakim Ziyech and Younes Belhanda. Ziyech returned to the squad after making peace with coach Herve Renard. Renard has brought discipline and flair to a team developing an exciting brand of football based on solid defending and fast attacking tempo. Key player: Nabil Dirar (Fenerbahce) - The versatile midfielder was a key element of the Monaco side that won the French league title last season. Coach: Herve Renard - The French coach has had success with other African teams, winning the African Cup of Nations with Zambia in 2012 and the Ivory Coast three years later. The first team to qualify from Asia, Iran sealed its spot with a 2-0 win over Uzbekistan in June. The Iranians went unbeaten in 18 qualifying games across two rounds. In the last round, Iran didn't concede a goal in nine games but finished with a 2-2 draw against Syria. Iran will be playing its fifth World Cup, qualifying back-to-back for the first time. Iran went winless at the 2014 World Cup, but this time coach Carlos Queiroz is targeting the knockout stages and has vowed Iran will "not go to Russia as tourists." Key player: Sardar Azmoun (Rubin Kazan) - The 22-year-old forward emerged as a scoring threat at the 2015 Asian Cup and has already tallied 22 international goals. Coach: Queiroz - The veteran Portuguese manager retained his job after the 2014 World Cup and has rebuilt the squad, bring in young players such as Azmoun.